‘Nigerian Seasonal Produce’ is a monthly column published towards the end of each month to celebrate Nigerian fruits & vegetables and personal stories. In this column, a writer explores a specific seasonal fruit, vegetable or leafy green assigned by the editors of Kitchen Butterfly and based on the updated Nigerian Seasonal Produce Calendar. For this month of January, we’re celebrating Ebelebo also known as Frunt/ Fruit/ Froot in some parts – rolls eyes. Our writer this month is Osisiye Tafa, the author of ‘Sixty Percent of a True Story’. 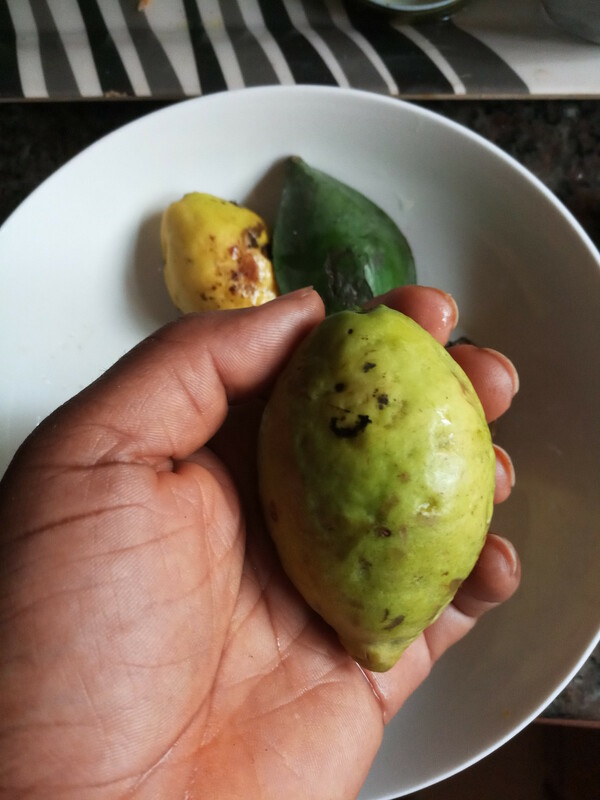 If there’s one fruit that ties many Nigerian childhood memories across state lines, borders, schools, it is ebelebo! Though we can’t agree on the name from Warri to Lagos and across the country, we all agree it is the stuff our primary school days were made of. 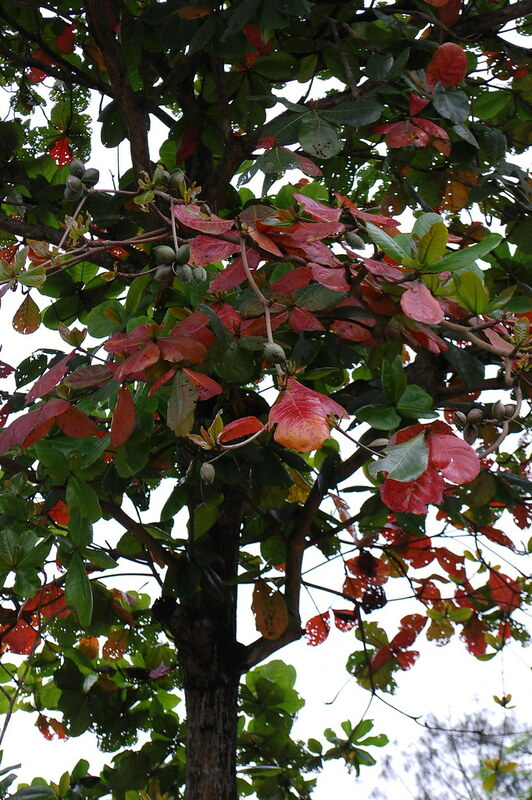 Ebelebo is also known as the Indian / sea/ country/ tropical or Malabar almond. What do you call a fruit when you don’t know its name? Ebelebo – your belle burst! Federal Staff School, Benin City has its classroom buildings arranged in a rectangle. One half, an L shape, is made of red bricks, the other ‘L’ is made of cement blocks, and painted white and blue to mirror the school’s colours. In the middle of this rectangle is a grassy quadrangle that sports metal goal posts at each end. At the edge of this field is the tree of life an ebelebo tree. This means all classes have a clear view of the quadrangle and as happens in primary schools, people spend most of class time looking out the window. On some sunny afternoons, you can see a fruit drop, in slow motion. A pointer to our absent mindedness was that immediately the bell rang for class over, people would engage in a mad dash to the tree to pick up the fallen fruit. 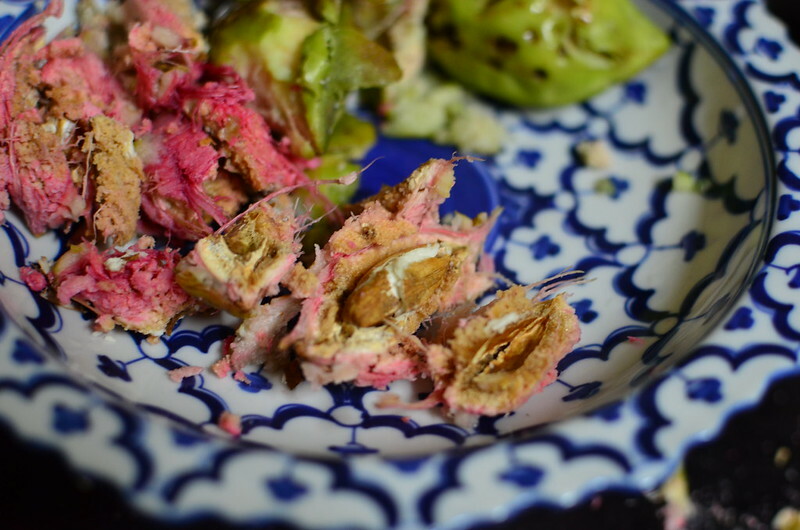 I don’t know what we really wanted, the fruit or outrunning everyone, because most times the fruits were rotten, and then we would call the fruit a contrivance of its name: ‘your belle burst’ to refer to the stomach upset that would descend on anyone that ate the rotten fruit. My goal as a child was to come first in picking an ebelebo fruit. I came first once, on a Thursday afternoon: I remember its salty taste and the sandy particles that fill your mouth if you keep nibbling on the seed. What do you call a fruit when you can’t be bothered with its name? I was bonding with the new girlfriend and that involved attending after office hours volleyball games at Eko Hotel. The court is a sandy patch, with a saggy net that we always had to mend, and floodlights that the hotel management always had to be reminded to turn on. On one side of the court is the long tennis court, basketball court, and seating area for picnics, and on the other end, an almond tree separates us from the lounge chairs and pool. For some reason, the server dropped the ball and everyone dashed to the tree. Chijioke (I think) got there first, picked the fruit, kept it in his gym bag, and the game resumed. Probably because of the way it drops like an announcement, almond a.k.a. ebelebo a.k.a. your belle burst, has always inspired races. On a certain day, I got to the court late and had to wait till they got to twenty-five, the end point for a volleyball game. 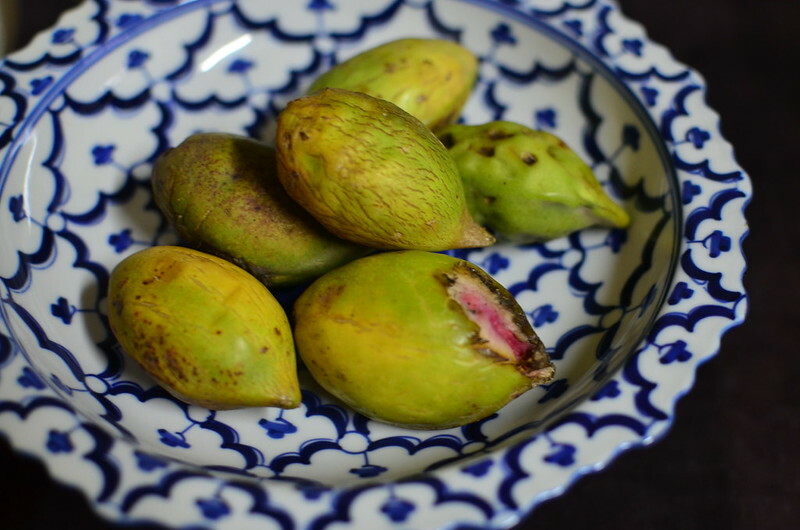 I climbed the almond tree – they are easy to climb with their bendy branches and sturdy stems – and watched the game. On the way down, I picked a fruit. After the game, I gave it to the girlfriend, ‘I plucked you a fruit’. What do you call a fruit when you are too posh to be bothered with the fruit? ‘Hey babes. Let’s stop at 1004, I want to buy almond milk’. And I was introduced to sophisticated society where (I imagine) my treasured ebelebo has given birth to an elitist child called almond milk. No more dashes, no more picking a fruit with trepidation hoping it wouldn’t be rotten, no more climbing of trees to get romantic gifts. Sometimes, I wonder about almond milk: if it is made from red or yellow ebelebo (or fruit similar)? Are the manufacturers sometimes impatient and use green, unripe ebelebo which will make your belle burst? Does that mean all the people drinking almond milk don’t know the joy of dashing to a tree, picking a fruit without crouching so no one runs into you, and digging into the fruit while running so the white and pink flesh fills your mouth? You mean you don’t know that ebelebo has fibres that get stuck in your teeth if you chew too close to the seed? Smh. Osisiye is a banker by day and writer by night. He writes creative non-fiction which he shares on his TinyLetter. His novel, ‘Sixty Percent of a True Story’ is available at Terra Kulture, Amazon, and Konga. 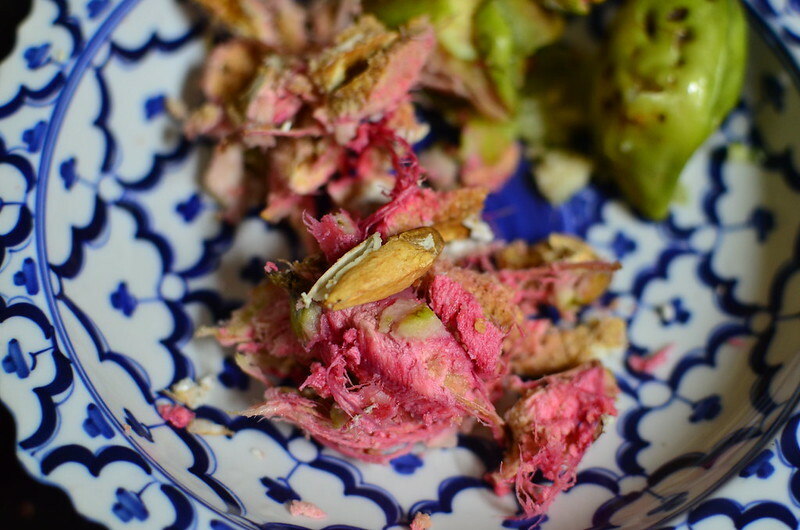 NB: ebelebo resembles almonds in many ways, but isn’t a ‘true’ almond. Thank you, Osisiye for sharing your memories with us. I appreciate it.